The Dicks are back, now as perhaps the worst masked heroes the World has ever seen! Fondly miss The Boys? 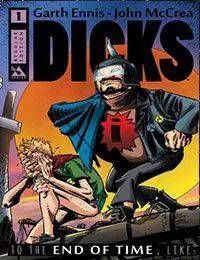 Well, this wont help much as GARTH ENNIS and JOHN MCCREA have even less respect for heroes with Super Dicks! Join the boys as they return to their riotous roots with the new misadventures of Dougie and Ivor! Just when you thought it was safe to go back into the comic shop, the Dicks are back for a new round of the most offensive misadventures imaginable.